Soak moong dal in water for about half an hour. Drain and grind with ginger,1 green chili and salt to a smooth batter, add as much water as required to make a batter of pouring consistency, keep aside. Add sabzi masala and mix well. Heat a tava and grease it. Spread a ladle full of batter to a thin disc. Drizzle a little oil and cook on medium heat till the underside is done. Sprinkle paneer mixture and flip the chilla carefully, drizzle a little oil and cook on medium heat till the other side is done as well. 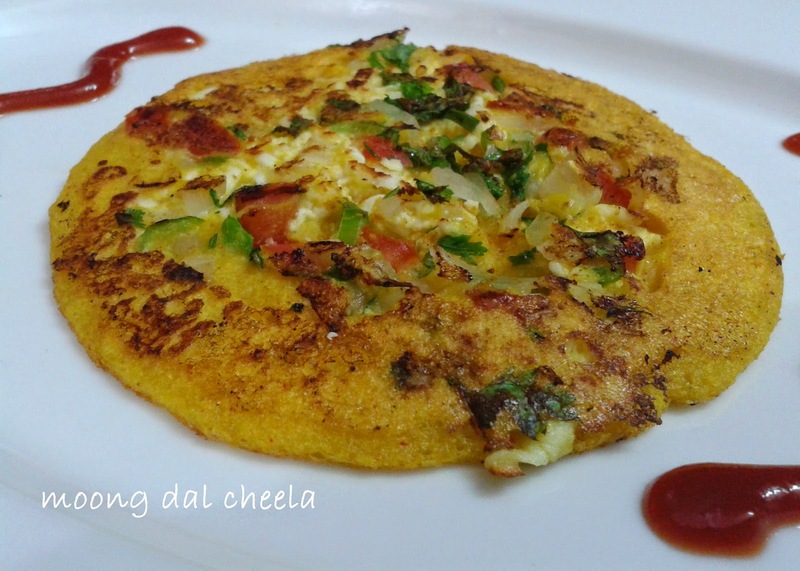 make more cheelas the same way. 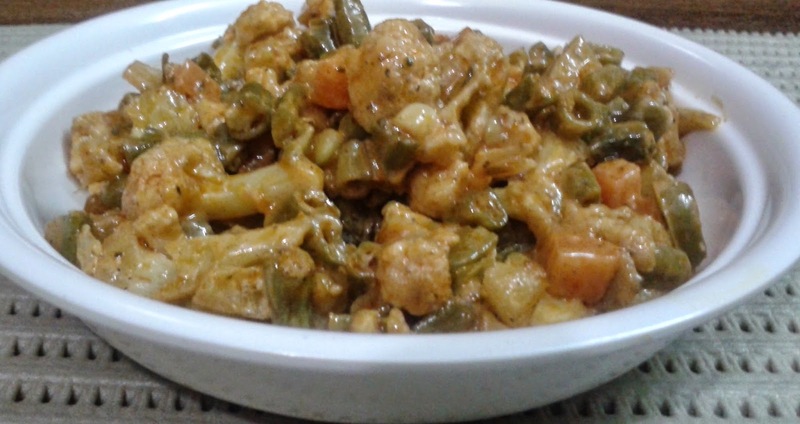 Serve hot with ketchup,green chuttney or tamarind chuttney. Soak the whole mung beans overnight. Drain out excess water from the soaked moong beans next day. Take a damp cloth and keep the soaked moong beans in the cloth. Tighten this cloth and keep this cloth with the moong beans in a container. Keep it in a container for 1 or 2 days. You will see small sprouts after first day and they will grow after second day. For longer sprouts, you can keep these for one more day. These sprouted beans stay fresh in the fridge for 1-2 days. So you could keep them in the fridge after they have sprouted. Or put the moong beans in a strainer and put some water in the container, now keep this in such a way that the water touches the base of the strainer. Keep rotating the seeds after every 2-3 hours.You can do it in microwave idli cooker as well. Put bean sprouts in a big plate or thali and check if there are any un-sprouted beans or hard beans, discard these. Wash the sprouted moong beans and drain out excess water. When they start to crackle add sprouted moong and saute for 2-3 minutes or till they become tender. Put this in a mixing bowl and add chopped onion,chopped tomato,chopped boiled potatoes,green chilies,salt , chaat masala ,coriander leaves and lemon juice and mix well. Serve it like that or you can serve it in fried canape cups. Boil 2 cups of water, switch off the gas and add 1/4 tsp salt to it then soak soya granules or nuggets for 1/2 an hour in it. After half an hour squeeze them and drain out the excess water. 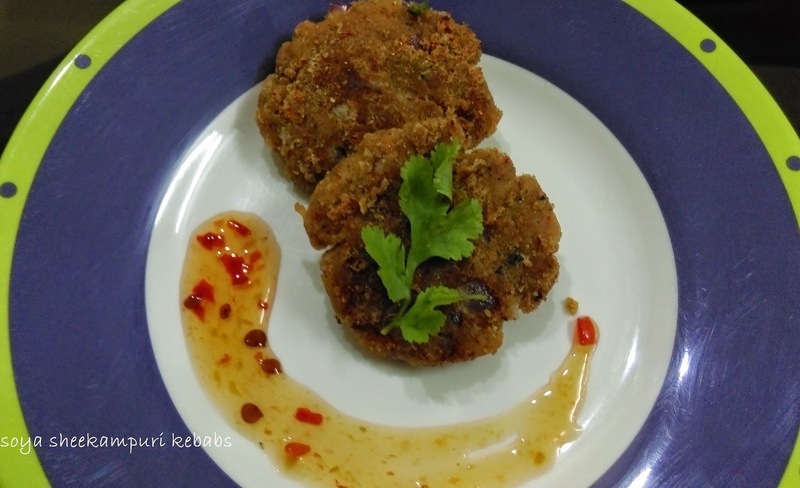 Grind these soaked soya nuggets in a mixer. Mix rest of the ingredients with ground soya nuggets. Shape them as desired and shallow fry or deep fry in hot oil. Serve hot with hot and sweet sauce or tomato ketchup. Soak kabuli chana at least for 2 hours in warm water or overnight in normal water. Drain out excess water and boil them in a pressure cooker along with 1/4 tsp salt and 2 cups of water. Drain out excess water and add rest of the ingredients and mix well. Grease the bread slices from one side and place filling on the other side of the slice and cover it with another slice of bread keeping the greased side out and toast it in a sandwich maker. Finely chop all vegetables accept peas and corn kernels. Heat oil in a pan and add onions and saute for a minutes then gradually add all the vegetables in order of their tenderness and cook them for 3-5 minutes or till they become tender but remain crunchy. Now add salt,pepper,pizza pasta sauce,tomato ketchup and processed cheese and mix well. 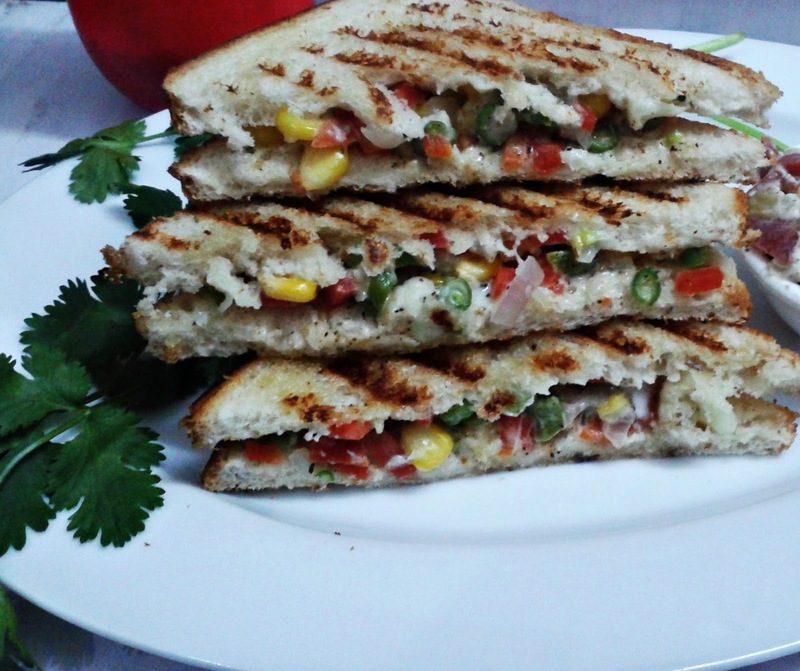 Cheesy mix veg is ready, and can be used in mix veg sandwich,veg puffs or mix veg tortillas etc as a filling. In another bowl, mix butter/oil and powdered sugar using a whisk or blender. Add soya milk and vanilla essence to the creamed mixture and mix until well combined. Add the all purpose flour mixed with baking powder in to the above mixture and use cut and fold method to make a batter or thick consistency without any lumps. 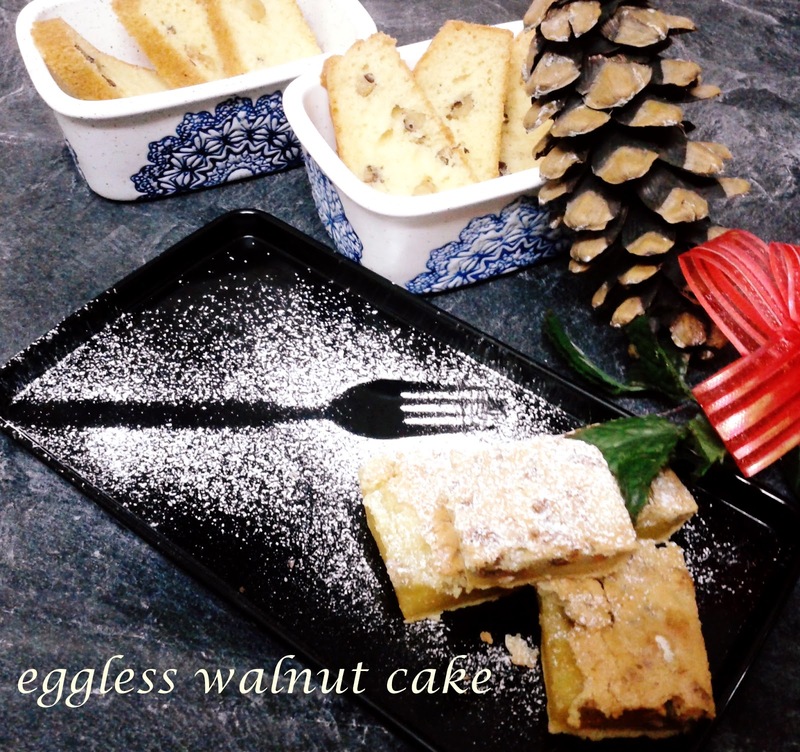 FInally, add the walnuts and fold in gently. Pour the mixture into a greased pan and lightly tap on the kitchen counter to remove any air bubbles. Keep the pan in the oven first for 10 minutes at 180 C and then at 150 C for 30 minutes. Ckeck with the help of a knife if it comes clean then it is done,now remove it from oven and serve hot. Holi festival may be celebrated with various names and people of different states might be following different traditions. 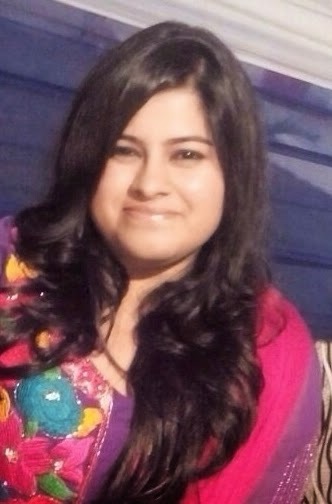 But, what makes Holi so unique and special is the spirit of it which remains the same throughout the country and even across the globe, wherever it is celebrated. 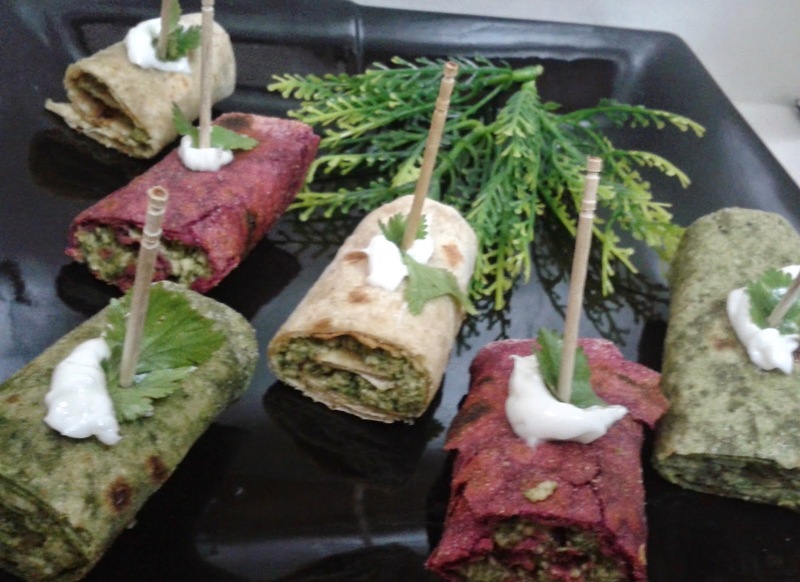 And what acts as a string and binds the nation together throughout celebration is our own delicious FOOD.SO time to relish some mouth watering easy to make holi special recipes. Clean the the spinach with running water and drain it. Grind it using little water to make a puree of it and keep aside. Clean the beetroot,boil it,peel it,chop it and make a puree using grinder. Keep aside. In a mixing bowl, add all the ingredients listed above except spinach puree and beetroot puree and divide the flour in three equal portions. 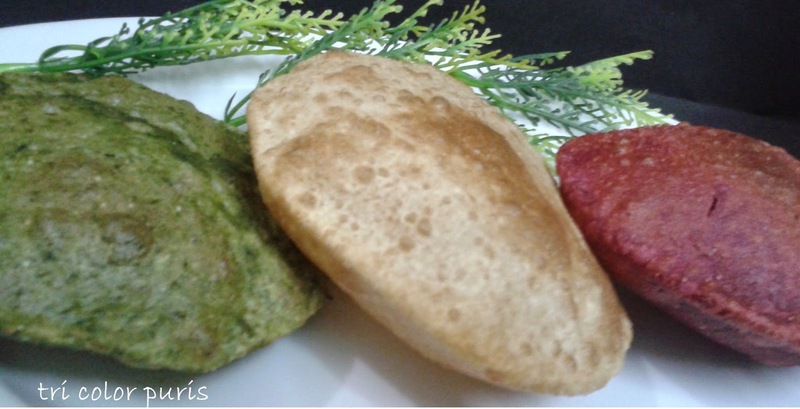 Make tight dough separately using plain water for plain puris, spinach puree for green and beetroot puree for red puris. Cover the doughs and keep them aside for 10 minutes. Make lemon sized round balls from dough grease it with little oil and make a round puri with the help of a rolling pin. Heat oil in a kadahi or wok and deep fry it. Repeat the same process for all types of dough. divide the flour in three equal portions. 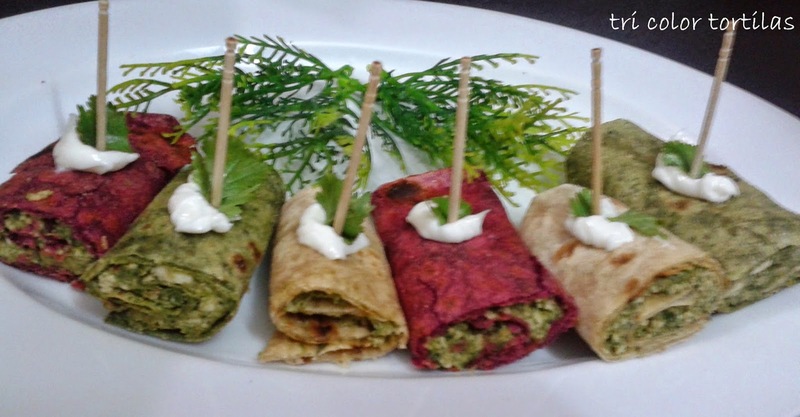 Make medium soft dough separately using plain water for plain tortillas, spinach puree for green and beetroot puree for red tortillas. Make lemon sized round balls from dough dust it with dry wheat flour and make a 8 inches round tortilla with the help of a rolling pin. Heat a griddle or tava at medium heat and place the raw tortilla on it. As soon small bubble start popping up, flip the tortilla and cook tortilla from the other side as well. Follow the process for all the types of dough. Clean the leaves with running water. ( use only leaves not stem). Boil 3 cup of water in a pot, add 1/2 tsp salt and 1 tbsp lemon juice. Once it start boiling, blanch the spinach leave for 30 sec. Remove the leaves from the hot water, drain it and wash it with cold water immediately. Squeeze water out from the leave and finely chop it. In a mixing bowl, add chopped spinach leaves, cream cheese, crumbled cottage cheese or tofu and all spices. Mix well and keep aside. Take home made tortilla or store brought tortilla. Spread the spinach cream cheese mix on top of the tortilla. You can add additional cheese or mayonnaise if you wish. Roll the tortilla tightly, make rest of the rolls same way. Cut the roll into small pieces. Serve these with a dash of mayonnaise and a coriander leaf on the top. 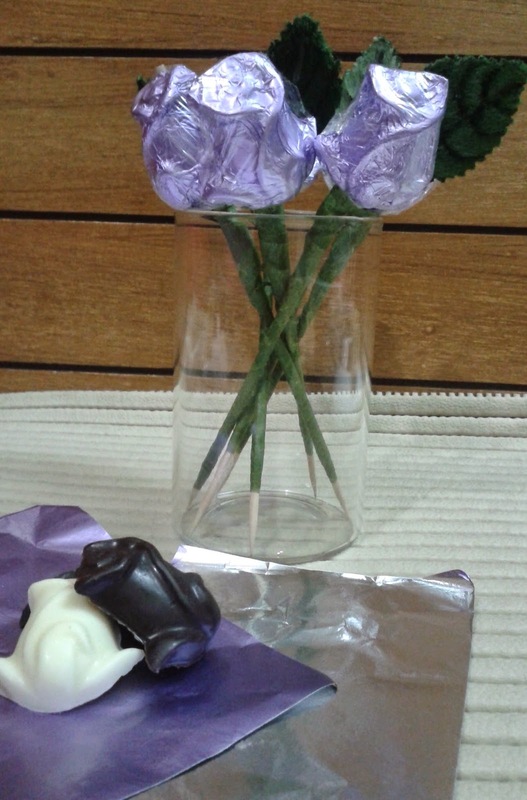 Grease a rose shaped chocolate mold and pour melted chocolate in the mold. 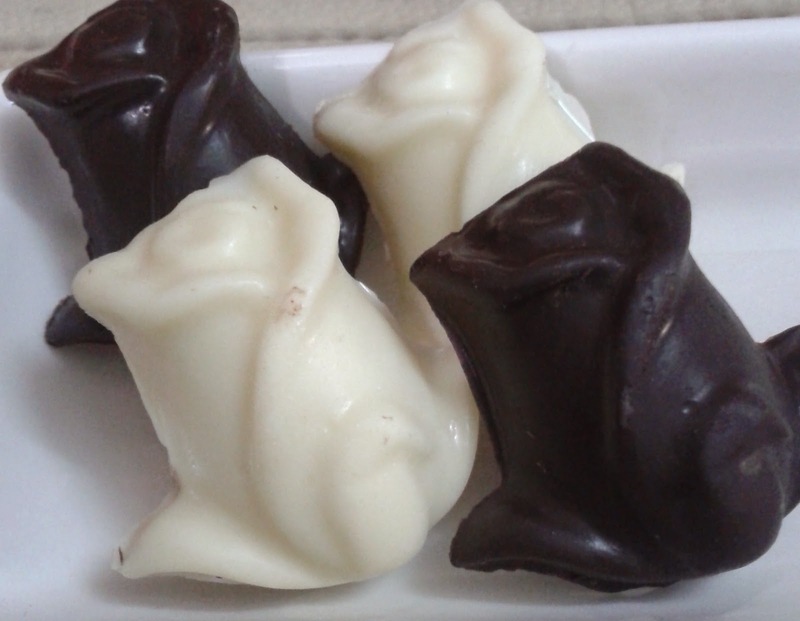 Keep the mold in fridge till it becomes hard and then de-mold the chocolates. 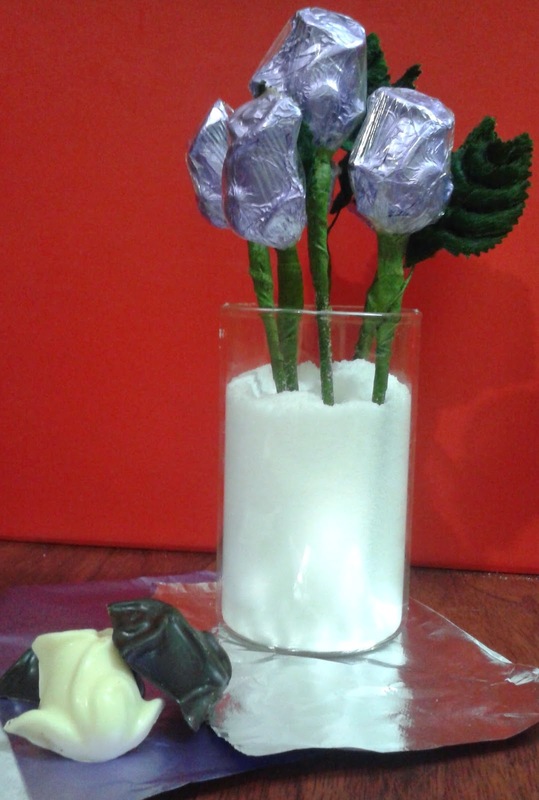 Wrap them in chocolate wraps and then hold one at a time with a long tooth prick(skewer stick) and wrap them together with a piece of cling film and cover the stick with green tape along with one leaf in each rose bud. 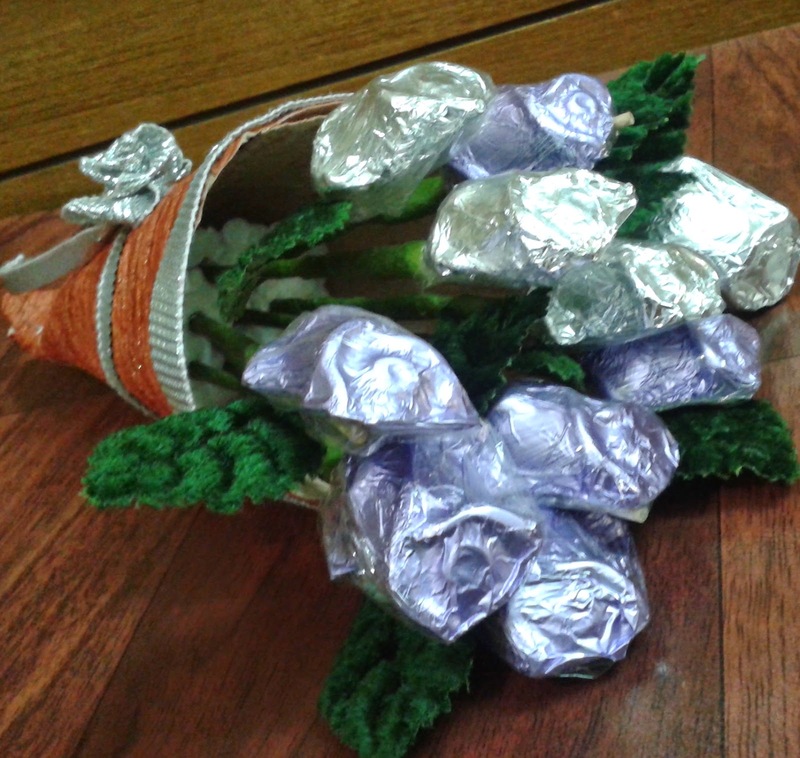 Make a cone of handmade sheet and and insert a piece of thermocol in it and arrange the chocolate roses in the cone.